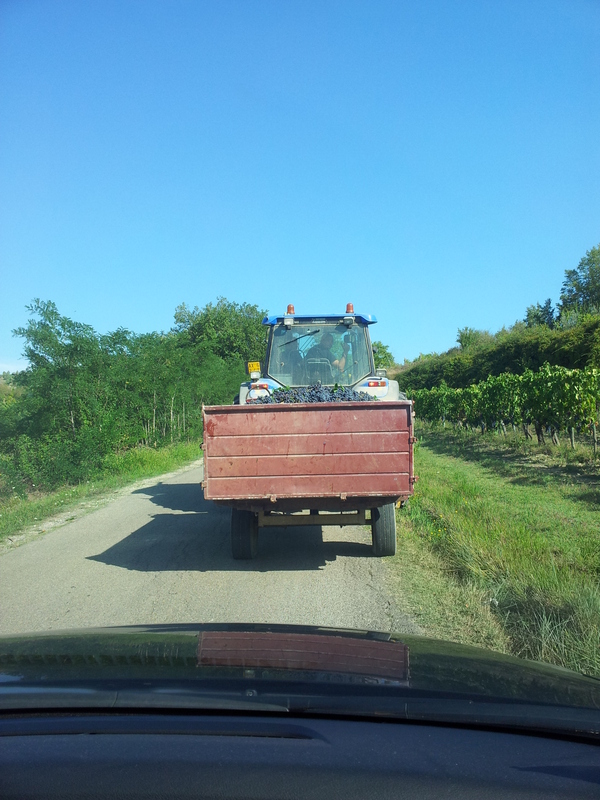 Well there we were, driving back home this morning after our coffee in Certaldo and we come up behind a slow-moving tractor and trailer of big juicy purple grapes. “Try and get a photo!” my man says. So I faff around trying to get my phone out of my bag, then remember that I have just yesterday put in a new lock code, and finally focus the camera on the windscreen just in time before the tractor takes off, after giving away to some tourist camper van! Phew, I did it! Now whats so exciting about this, you may ask. Well it is really hard to get photos, because these tractors are usually going at full pelt past our kitchen window or in the opposite direction to the way we are driving! So, just for you, here is my successful photo for your enjoyment. 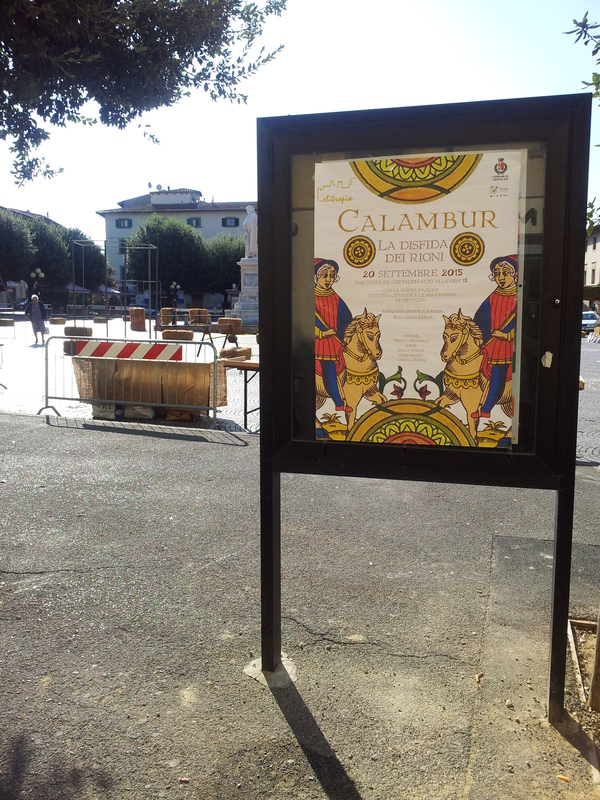 A Calambur poster and preparations going on behind in the main Piazza in Certaldo. Handsome Certaldo contestants getting ready to do battle. commune, who all have their own flags and colours. It is a really serious and important day, full of testosterone and the girlies all giggling, as the handsome contestants line up. It will be impossible to park anywhere near the centre of town this afternoon, so we will hear all about it tomorrow and report back to you next week! 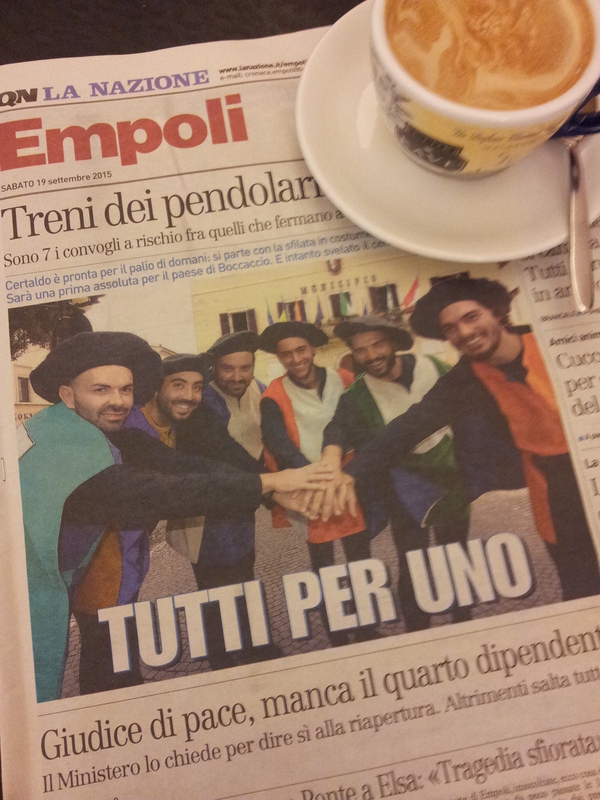 Then, over coffee at Bar Solferino, I read that Prime Minister Renzi has announced a 2% drop in the tax rate for the agricultural sectors. I’m not sure how effective this will be as I hear whispered that very little profit is declared, well in this region anyway! Meanwhile, back at our lovely little villa the sun is shining and it is a perfect twenty-eight degrees centigrade. 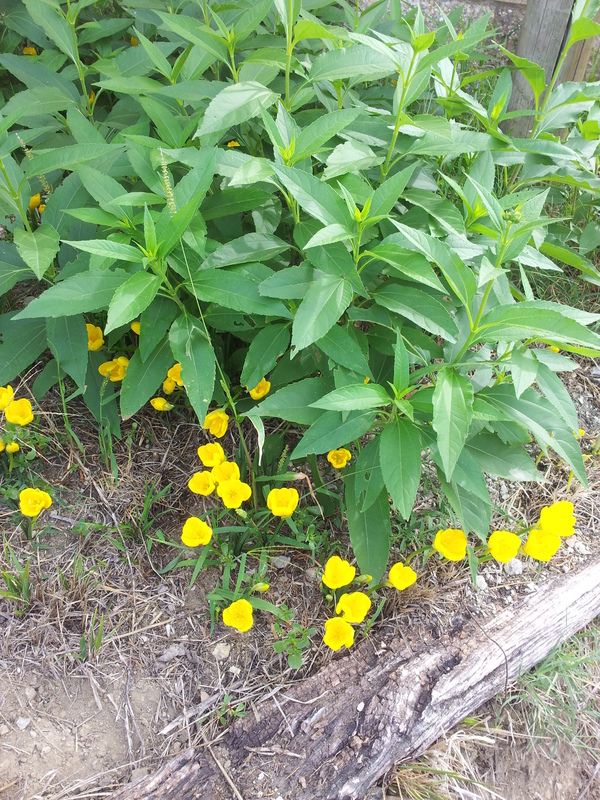 As we drive in we spot the first wild yellow crocuses by the side of the road; beautiful. 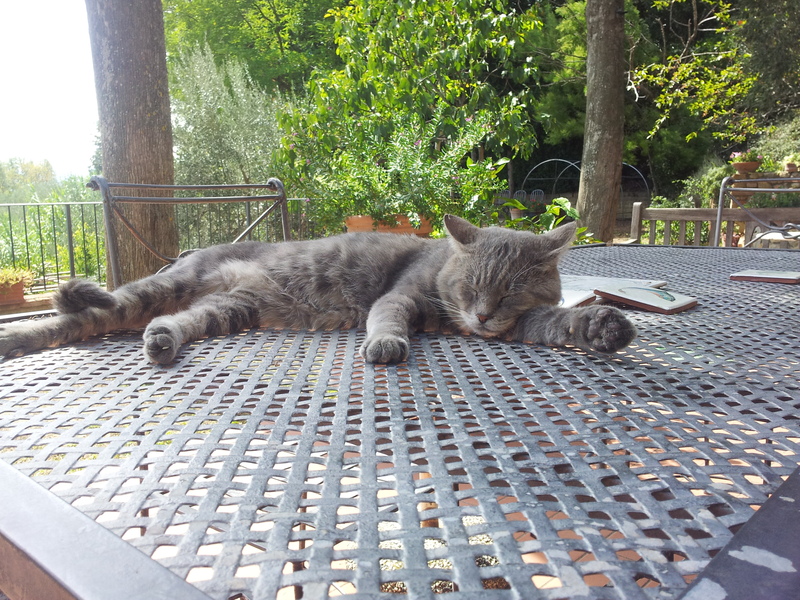 I think today we will have a nice lunch in the garden with Farty Barty the cat, who has been very much hanging around the house of late. In the high winds last week, an old tree crashed down into the garden and was chainsawed by our local contadino into a pile in the corner. It only just missed one of the garden lights! Now we need to tidy up the small bits of debris. I think I can hear my man working in the garden now. He has been a been a bit stressed after his return from a few working days work in London, so that should help him relax. Otherwise, I look forward to the return of my sister-in-law, who will be here in two weeks time, to tidy and pretty up all the garden pots for autumn. But what is this I read about the gorgeous Silvio Berlusconi? Oh no, he is trouble again, but this time whilst having fun with his close friend Vladimir Putin. They have both been named in a criminal case over the opening of a 240 year old bottle of wine, known as Massandra Sherry 1775, that was worth £58K! A lady called Ms Pavlenko allegedly opened it when Silvio asked for a taste whilst on a tour of the Massandra Estate in the Crimea. I feel really sorry for her as, lets face it, she was standing there being asked by an alleged so-called friend of the Mafia (according to some members of the media) and his buddy who heads up the KGB, to open a bottle of wine. What would you have done? Well, enough of that. Must think about this lunch I said I would cook. O Dio, well the sun is still shining, so we really should not go off to the restaurant. On the other hand………. ‘My Father, The Assassin’ Book one in the series.